Finally I caught 'Persepolis'. Had heard so many good things about the film and it still managed to surpass all my expectations. It has taken me years to realize the importance of animation movies. I have never found myself fascinated by the idea. As a result I never opened myself to this genre. Deciding to watch an animation was difficult. But whenever I went for it, I was satisfied, and impressed. It was only after 'WALL-E' although, and then 'Ratatouille' that I realized the importance of these films. Animation empowers you with the ability to tell stories that you could never imagine otherwise. It empowers the storyteller in you to go beyond all conventions and create a world nobody would have thought of. And then I saw 'Persepolis', an animation all right, but more than that, a political film, close to a social satire, semi-autobiographical and a treat for any lover of meaningful cinema. It is an important film, not just because of its political statement, but also for the future of cinema in general, and the animation genre in particular. Soon, I hope, the already diminishing line of divide between films will end. And instead of labeling a film as 'art' or 'commercial' or into a genre, we will all accept films as just good or not-so-good films. It is high time, an animation film gets nominated in the 'Best Picture' category as well, apart from the less celebrated 'Best Animation Feature' category. By the way, 'Waltz with Bashir' is already with me, and I should be watching it soon. Also saw Wim Wenders' 'Alice in the Cities'. Beautiful movie. It is one of those movies that make your day. It was sad to know that Yella Rottlander, who plays the little Alice in this 1974 film did not have much of a career as an actor afterwards. But in this film she was more than wonderful, one of the performances you are not likely to forget. Among the first Sci-Fi films of cinema history. Inspite of being a silent film, it took two years to shoot. Thankfully, this gem has been restored and we now have a version close to the original. I wish something like that could be done for our very own 'Neecha Nagar' (1946). P.S. 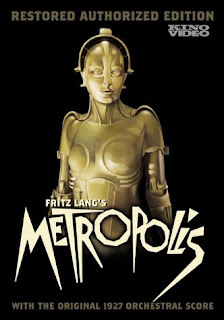 Reportedly, 'Metropolis' was one of Hitler's favourite films. See, the power of cinema- one thing that both we and these historic personalities could share!